Southport, CT June 25, 2009 – Sturm, Ruger & Co., Inc. (NYSE: RGR) is proud to introduce a special Single Action Shooting Society (SASS®) Ruger® Vaquero®. The high-gloss stainless steel SASS Ruger Vaquero comes with the lower/wider Montado style hammer found on the stock Ruger Montado. The SASS Ruger Vaquero is chambered for .357 Magnum, features 4-5/8” barrels and black checkered hard rubber grips that contain the SASS logo. They will bear a special serial numbers featuring the letters SASS followed by the numeric sequence. The special edition single action revolvers will only be sold in two-gun sets of consecutive numbers and will ship in a special red two-gun carry case. 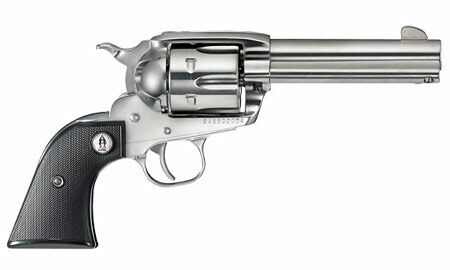 Ruger Vaqueros are designed to offer the original “Old West” single action look, size and feel. Built on a mid-sized steel frame, Vaqueros have the patented Ruger reverse indexing pawl, which positively aligns the cylinder with the loading gate cutout for easy loading and unloading of cartridges. A beveled cylinder for easier holstering and a larger crescent-shaped ejector rod head in traditional form are additional features designed to make the Vaquero one of the most user-friendly and durable single action revolvers on the market. The new SASS Vaquero may be seen at the SASS End of Trail June 25th thru June 28th 2009. The SASS revolver will be available from all Ruger Distributors in August. For more information on the new Ruger SASS Vaquero, available from all Ruger distributors, visit www.ruger.com/SASS .